Here is what we were up to at the Suchitra Campus. A visit to the market –whether a supermarket, a local grocery store or a farmer’s market – fills the senses with sights, sounds and smell. The market is a place to build Math, Science and language skills. As the kids are too young to go to the market in such large groups we created a ‘Mock Market’ in the school itself. Looking carefully at and discussing the array of vegetables and fruits, while packing, lead to learning of interesting new words as well. The mock market was not only a part of learning but fun and excitement too. We thank the staff members of Suchitra Academy, for participating in this activity. This would not be such a success without their help. The Pre-Primary Kids went on a campus tour to have a look at the parking area. They observed the parking areas allotted to various vehicles, like the two wheelers, cars and buses. Kids also counted the number of tyres in each vehicle and then went ahead counting the buses parked. To continue with the activity kids were taken to the parking lot to wash cars and buses. Children enjoyed scrubbing and washing the vehicles. They also got into the driver’s seat to see the steering wheel, clutch, break and other internal parts of the vehicle. Field trip to the ‘Biscuit Factory’ was a treat for the kids. The fatigue of the long journey vanished as they reached the factory. The aroma of baking biscuits was mouth-watering. Children got the opportunity to see how huge quantity of biscuits were prepared with help of machines. Mixing huge quantity of flour to make dough and the process of baking was a great learning opportunity for the kids. We would like to thank Ashray’s parent Ms. Radhika for making this happen. Thank you Radhika for your kind help and support. Parents kindly contact the class teachers if you could come to school and talk about the festival to the kids. 25th – Suchitra Food Court by Sr. KG. On Wednesday, 9th July, a special assembly was conducted on the topic E- SAFETY. Dear parents, as the age of the average internet user is decreasing day by day, it is of paramount importance to make them aware of its hidden dangers. The children were explained in details the dangers on the internet and the safety measures to be observed while surfing the net. The dos and don’ts were clearly understood by the children. They understood the importance of being S.M.A.R.T online. Be SAFE, NEVER MEET any online friend in person, DO NOT ACCEPT requests or open e mails from people you do not know, not all information is RELIABLE, TELL a trusted adult. On the same day grade IIA conducted a special assembly on the topic KNOW SAFETY, NO INJURY. It stressed on the importance of observing safety precautions both inside the school, house and even outside. An informative ppt was shown and the children also sang a song. The children spoke very well and their confidence was unmatched. Good job grade IIA! Thursday, 10th July was a day to apprise the children of EATING ETIQUETTES. The children were shown a ppt and video clips on the correct and acceptable behaviour at the dinner table. They learnt the names of various crockery and cutlery used and also the correct way of laying the table and holding a fork, spoon and knife. The importance of good table manners was also highlighted. Since Monday, 14th July, the school campus has been a beehive of activity. The preparations for the upcoming Language week are in full swing. The elimination rounds of the various competitions have been conducted and the selected children are busy with their preparations for the upcoming competitions. Dear parents, it has been our endeavour to let every child have a fair chance to make it to the final selected team. But you will agree that all kids cannot make it to the finals, just as all kids cannot get the rank I or II. Important thing is have they benefitted, learnt and grown in this process. Some of the events like One-Act play are not available to certain classes for various unavoidable reasons. We are aware of this and shall be attending to this at some later date. Giving equal opportunity to all is NOT AN EMPTY BOAST of ours. – II Term Fees is to be paid before 31st July. – Avoid sending children with fancy pencil-boxes, stationery, small toys etc. These cause many a fights in the class besides getting lost. – THE HAIR CUT FOR BOYS HAS TO BE REGULAR SHORT and not with fancy styling or mushroom cut. – On birthdays only simple sweets and chocolates are allowed. – Counsel children to not be rough and rash in the school or buses and to be particularly careful in the staircases. Sincere thanks for being supportive and ever helpful. Our theme this month ‘Farm to the table / transport’ has led to much activity and kept the children busy through the fortnight. 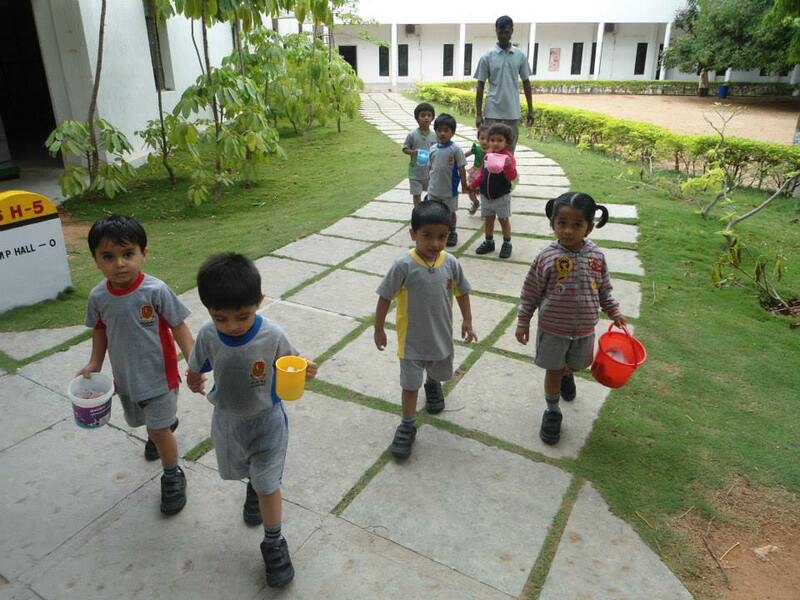 Besides creativity, music and movement children have been enjoying various activities. On Wednesday 25th June the Pre-Primary kids turned into little chefs. They saw, touched and felt the wheat grains, they also saw the process of turning wheat into flour. Later class teachers kneaded the dough, which kids rolled into small rotis and cooked the roties in our school kitchen. Kids were very proud of their roties and relished them during lunch time. To show kids that their lunch does not come from opening the fridge or going to the supermarket we decided to take the kids on a trip to the farm to make the learning more interesting and exciting. On Thursday 26th June – Field trip to the farm offered experiential learning opportunity about how food grows in the farm and latter gets transported to the market and then to our table. Children had the opportunity to meet the farmer and watch him harvesting grass. Students also watched process of milking the cow, exploring the farm and surrounding habitat which provided an enriching, hands-on learning experience to the kids. On Friday 27th June – we had ‘The Green Bowl Day’. Healthy fruits, vegetable and sprout salad was made, children were educated on the importance of fruits and salad in their daily diet. As we had just been to the farm a day before, the children could connect the process of food moving from farm to the table. Dear parents, simple Snack recipes can give kids a chance to get their hands involved in cooking experiences and be able to eat their creations. Every pre-schooler loves the chance to cook like a big person and play with the food. Cooking with children encourages healthy eating, interacting and independence. Drawing competition was held on Thursday 3rd July for the Sr.KG section. It was a nice opportunity provided to the children to put their imagination on paper. The process of creating the art work itself builds self -confidence, as the topic was not specified, children’s imagination ran wild and they came up with amazing art ideas, which they made more attractive by adding various colours. 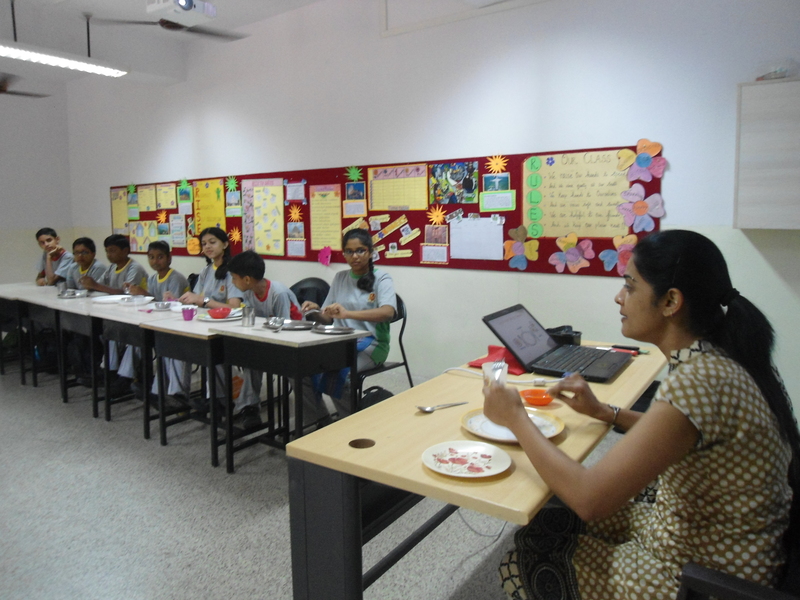 To understand different ways food can be cooked, baking activity was conducted on Friday 4th July. 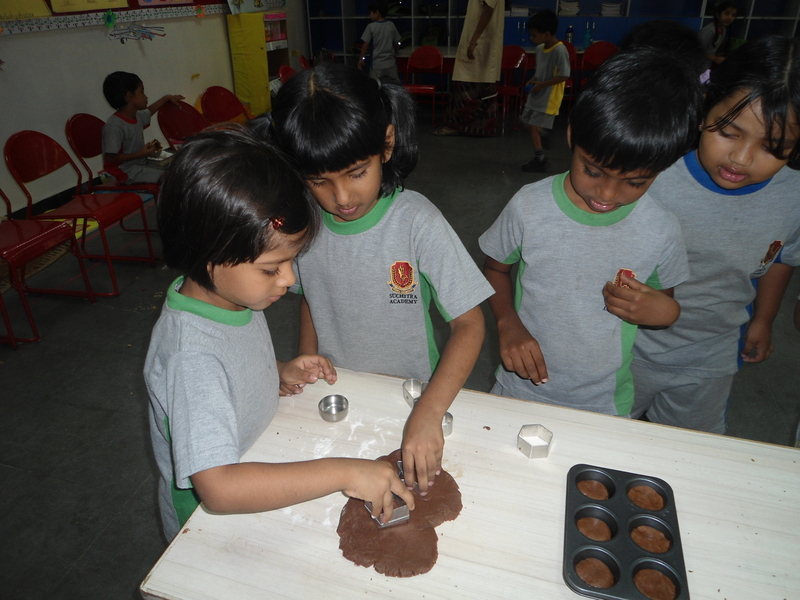 Our little kids turned into bakers, rolled out dough and cut various shape cookies, which were baked in the classrooms. Children were amazed to watch the cookies change shape and colour as it baked. It was an awesome treat after all the hard-work. I cannot stop thanking you, dear parents for your spontaneous and continued support. I would also like to say a special thank you to Ronsher’s parents for the Farm trip. (3rd July Drawing competition )Ma’am pls help I don’t know what to write before hand)This para will be sent shortly. FA-1 commenced on Tuesday, 24th June. The children were enthusiastic and confident about their preparations and we are sure they will fare exceedingly well. 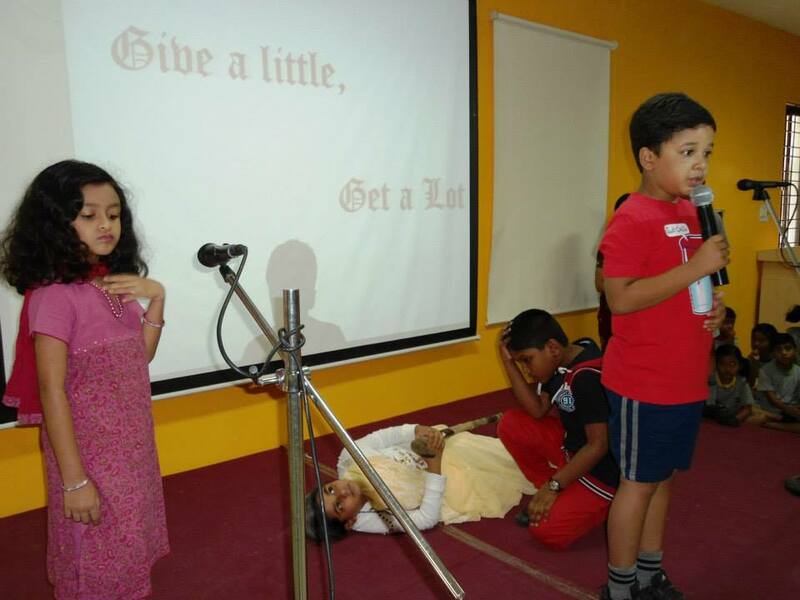 On Wednesday, 25th June, Grade IIIB conducted a special assembly on the topic ‘GIVE A LITTLE…. GET A LOT’. 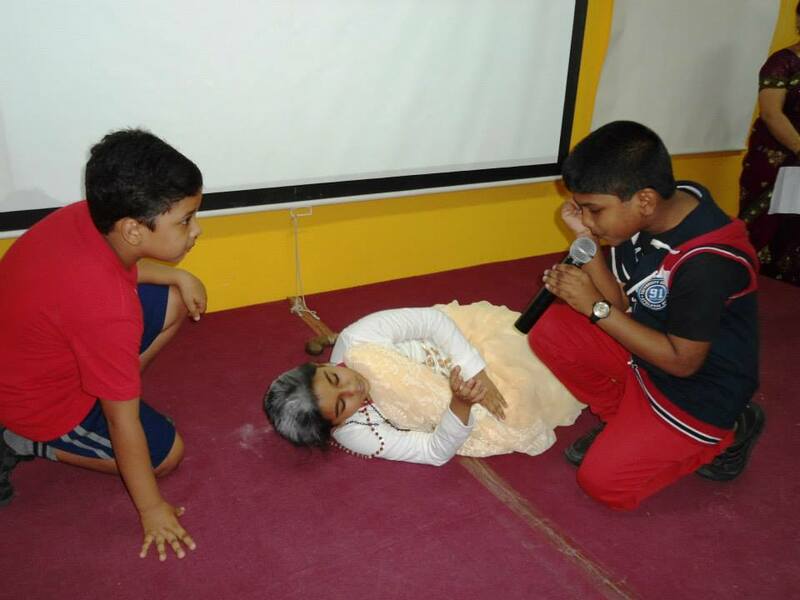 The children enacted a short skit which highlighted the delicate balance of relationships in life and also conveyed a moral that life is a full circle and hence it is important to do good unto others so that the same comes back to you. They showed a ppt. on Mother Teresa and also presented a beautiful song. Good job grade IIIB. As a part of the Leadership Curriculu m, a LEADERSHIP ACTIVITY was conductedfor grades I to X on Thursday, 26th June. Various aspects of leadership were discussed and also the ways in which to acquire and nurture these skills. A Display Board Competition ‘BATTLE OF THE BOARDS’ washeld on Monday, 30th June. 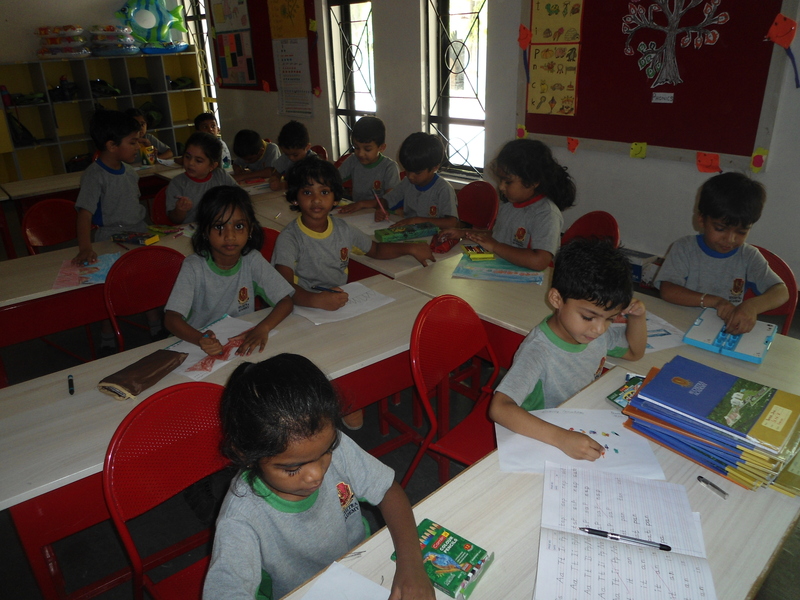 It was the day when each and every classroom was looking its best with lots of charts and display models. The effort of the students and the teachers was evident. 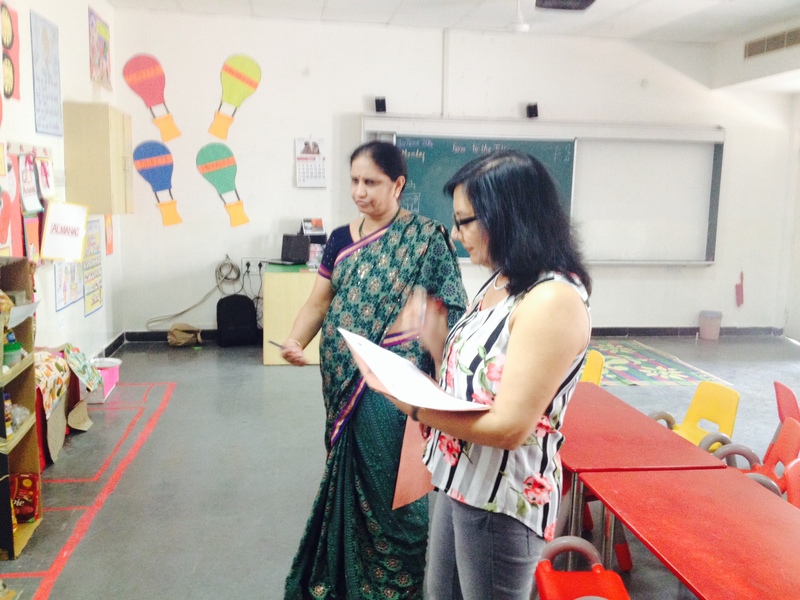 Mrs. Jayshree, Principal Pallavi Model School was the judge for the day. She wholeheartedly appreciated the efforts of the children. A PPT ON FIFA world cup was also shown on Monday, 30th June. This was our endeavor to make the children understand the current World Cup mania! The journey of FIFA was explained right from its beginning to its present splendor. It was a very informative presentation. 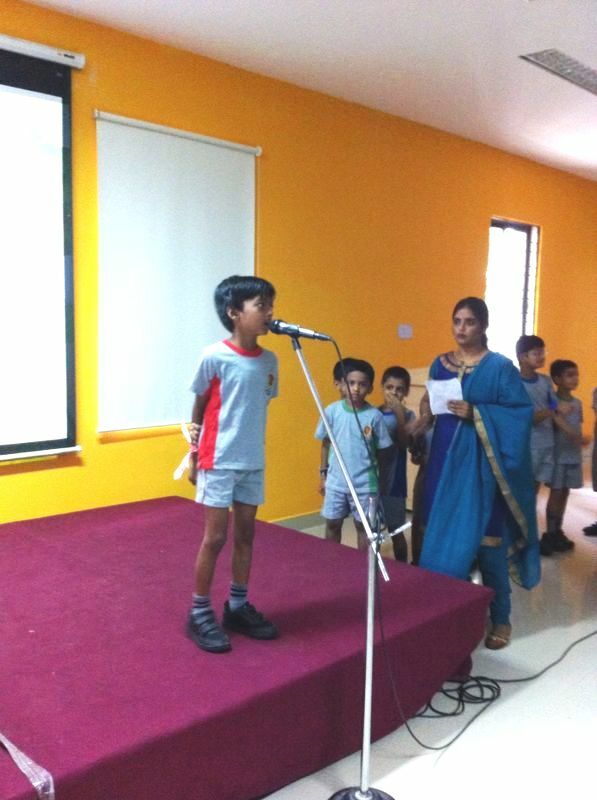 On Wednesday, 2nd July, grade VIA conducted a special assembly on the topic ‘LIFE’S TOO SHORT TO BE ORDINARY’. It focused on the uniqueness of each individual and also the fact that one gets an opportunity once in a lifetime to do something great. They spoke about the simple pleasures in life and how one should try to keep things simple to be happy in life. 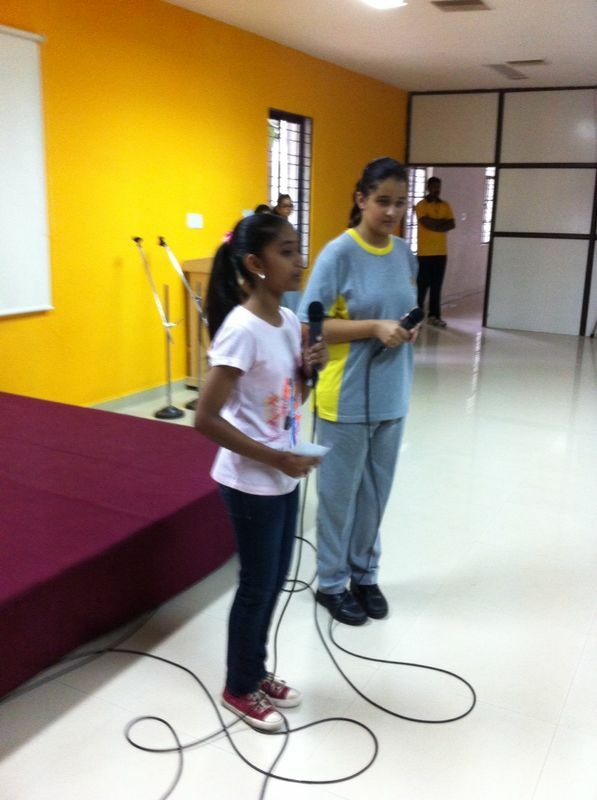 They portrayed this fact beautifully through a skit and also sang a peppy number. Grade IIIA also conducted a special assembly on the topic ‘LAUGHTER IS THE BEST MEDICINE.’ They enacted a skit and sang a melodious song. A PAINTING COMPETITION for grades I to IV and a ‘MAD ADS’ COMPETITION’ for grades V to X was held on Thursday, 3rd July. The younger children were excited to paint their hearts out and made full use of their imaginative ideas and colours. The finished paintings show that a great future awaits these little Picassos and M.F.Hussains! The older children were overjoyed to show off their acting skills and their comic timing. The four house teams were given a product to advertise and they created some crazy mad ads which had everyone in splits of laughter. 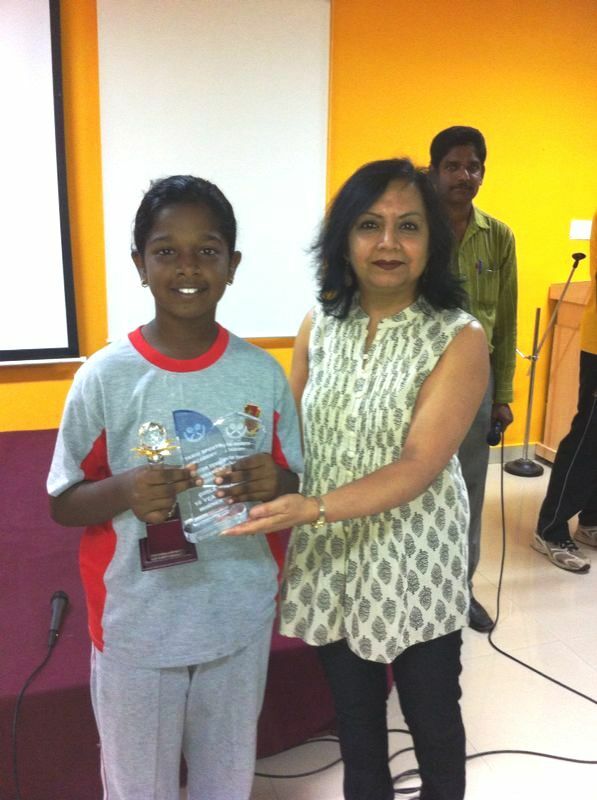 The Winners were ‘PRAKRITI HOUSE’ and the Runners up were ‘SANSKRITI HOUSE’ TEAMS. The first PMI after reopening is being held on Saturday, 5th July. This is the time to interact freely with all the mentors and get to know the child’s progress so far at school as well as in the on going FA-1. Dear parents, we sincerely hope that you take out time to come and meet the mentors. This is also the time to give your feedback about all the things at school. Your invaluable feedback will help us understand if we are on the right track. Dear parents a special note- In Suchitra Academy any corporal Punishment is considered a grave offence. In case your child reports any hitting, pinching, punching, twisting of ears etc. by any staff, Please bring it immediately to my attention. You may even call up and complain anonymously ( so that your name doesn’t come up). Rest assured, immediate action will be taken. 21ST July – Language week begins. Hope you enjoy reading our round-up of the fortnight.